If you're reading this page, you're probably looking to hire an inspector and maybe having trouble differentiating from all of the inspection company web sites. Here we have provided an unbiased list of questions that you should ask of a home / building inspection company prior to hiring someone to provide critical information about the largest purchase you probably will ever make. Click any heading below for more details. You can learn more by reading the "Our Qualifications" and "Our Service" pages of this site. Also, watch the 4-minute video for an overview of our service. Although this is often the first question we hear, the price should not have the most bearing on whom you hire. Inspection companies that market themselves with low prices usually do so because they are new in the business (read: inexperienced) and, being unable or unwilling to distinguish themselves with high quality service, they fall back on low prices. We are continually astounded by buyers who try to cut corners on this one critical aspect of the discovery process of the property they're looking to buy. It is a mistake to hire a company simply because they have the lowest price -- you will end up with the lowest quality service and you could end up really regretting it. When you are shopping for a comparable item, such as a DVD player, you can decide which model you want and then price shop for the lowest price. With home inspectors, it's different. There is no comparable item. Prices will generally reflect experience level and the quality of service you will receive. It is the same with contractor -- the lowest priced contractor is the one who knows how to cut the most corners. Ask these other questions to get a better idea of the service you will receive because inspectors all provide different levels of service and cannot be price-shopped. Contact our office with details of your property for a price quote and detailed written proposal. Even though there is a home inspection Standard of Practice in New York State, it is very limited in scope. Therefore, someone providing service that minimally adheres to the State standard is not providing much. The better inspectors will exceed that standard (as well as any other standards, such as the ASHI one). Anyone you hire should be able to give you a detailed explanation of their inspection process, whether verbally or in writing. Contact our office for a detailed written proposal of our service. Is a sample report available? Many inspection companies provide a sample report on their web sites. If they don't, you should ask for one. This is where you get to see the level of quality provided by a given house and building inspection service. Is the report clear and easy to understand? Are there photos? If so, are they large enough to see the pertinent details and clearly annotated? Does the report look like it explains issues in enough detail or will you continually have to call back to get clarification? Are there cost estimates? Perusing a sample report is a must! Although many companies will have a sample report available for download at their web sites, other companies have not bothered to make sample reports available. A refusal to this request should be regarded with suspicion. We have seen many home inspection reports on other company web sites, and aside from obvious spelling mistakes and poor grammar, many of these reports are really hard to read -- being jammed with redundant disclaimers and vague sentence fragments, leaving very little useful information. 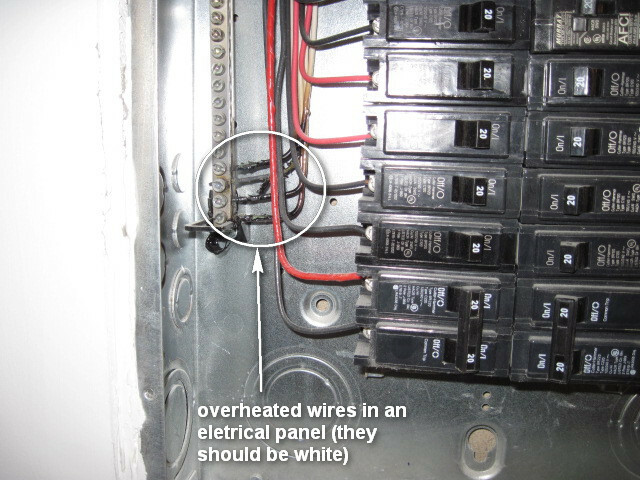 We saw one report recently where the text said that everything about the electric panel was OK, but the picture next to it showed an immediate fire hazard. Some companies provide a site-produced hard-copy-only report format commonly referred to as a "checklist" report that you will not be able to download. While these written reports are given at the inspection site, they are limited in specific detail, except for some handwritten comments, and they contain a lot of general information that is not relevant to your house. Our report format is 100% property-specific, easy to read, and includes annotated, large, color, digital photos (25 - 50 on average) highlighting areas of concern. Our reports average 40 - 60 pages in length for the typical house or building (co-ops 20 - 30 pages; condos 25 - 40 pages) and contain information you can use, including how things work and maintenance tips. Costs estimates are provided for major items where appropriate. Extra time is taken to prepare these reports but they are delivered online on the business day following the inspection (often by mid-morning) as well as sent by hard copy in the mail. The report can be used as a reference or owner's manual for years to come. Contact us for a detailed proposal and sample report. Do your reports include cost estimates? Knowing that a heating system or roof is shot is one thing. But you will really want to have an idea as to what the replacement costs will be so you can plan accordingly and/or maybe negotiate the sales price. Make sure your inspector can provide cost estimates for needed repairs. We provide written cost estimates for major items. Do your reports include photos? There are still a few inspection companies out there that don't provide photos in their reports. Incorporating photos takes extra time, but a picture is worth a thousand words and reports are more valuable to you with them. Our reports contain 25 - 50 photos for the average house or building. When do I receive the written report? When purchasing a property, once you have an offer accepted, you have a limited amount of time to sign a sales contract. In many cases, the seller wants to move things along as quickly as possible. Since a property inspection plays a major role in helping you determine if and how to move forward, you need to have the written report as soon as possible after the site inspection. Most companies will provide it within a few days via mail or email. Ask this question to make sure you will be able move along in a timely manner. Beware of "checklist" reports that are given on-site, as they are generally an inferior product, that forces you to navigate large areas of irrelevant text and short handwritten sentence fragments. Our reports are delivered the following business day after the inspection. Most lenders will require a termite certificate in order to underwrite a house. A separate termite inspection from a pest control company can cost anywhere from $75 to $150. Many building inspection companies include them with their reports but some don't. If you must choose between having the certificate provided by the house inspector or a pest control technician, remember: the house inspectors do not sell treatments (and are therefore not motivated to "find" a problem). All of our residential purchase reports include a termite certificate. Do you access the roof with a ladder? Buildings with pitched roofs (and even some with flat roofs) do not have roof access from inside. The only way to fully evaluate the condition and quality of installation of the roofing material is to see it up close. The only way to see it up close is with a ladder. Most inspectors will not access a 2-story roof with a ladder, so this is an important question to ask. Even if the roof is new, it does not mean that it was installed correctly. Proper evaluation of roofing cannot be done from the street with binoculars. Some inspectors use contraptions, such as camera poles and even drones. But there are details that even the best of these contraptions will miss. For example, no contraption can tell how many layers of roofing are present. For that, you have to physically lift the bottom course to check. This can determine whether roof replacement will be double the cost because of having to remove the old shingles prior to reroofing. The roofer figured that he knew better than the manufacturer and he could save a few bucks by skipping the tarpaper (underlayment), which is supposed to be installed on the roof deck before the shingles go on. What he didn't understand is that not only is the roof now at a much higher risk of leakage (active leakage was in fact occurring in this building), and not only would the manufacturer void the roof warranty because their instructions weren't followed, but roofing shingles are given a "Class A" fire rating based upon being installed with a manufacturer-approved underlayment, such as tarpaper. This means that the property insurance carrier could potentially deny a claim in the event of a loss from fire -- something the owners only would have found out after the loss. 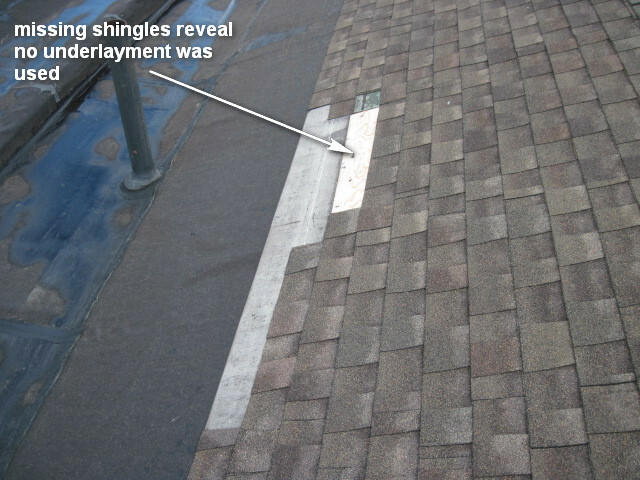 By the way, the missing shingles in the above photo is another indication that poor installation practices were used. The only way to remedy this is to tear off the roof and do it over again, at a cost for this property of $8,000 to $10,000. This condition was impossible to see from the ground. Roof inspections cannot be done from the ground with binoculars. All 2-story building inspections include ladder-access to roofs. Do you open all electric panels? The above panel was opened in an apartment in relatively "new" construction. The four white wires terminating at the left had blackened from overheating and they were still too hot. This is a fire waiting to happen. Be sure that any inspector you hire has a policy of opening all electrical panels. What do you do to assess water entry or leakage? Even a small amount of water leakage can cause big problems in building, if it is undiscovered for a long period of time. Concealed mold could grow and cause health problems for sensitive occupants. Other than looking for visible signs of leakage, such as water staining, water damage or visible mold growth, there is more that can be done to determine if a given house or building has water leakage problems. Many, but not all, inspectors use moisture meters, which can determine if and how wet a water stain is. If a stain is wet, you have a genuine issue that you can bring to the table in a property purchase. Many sales contracts stipulate that a building will be delivered "leak-free", and therefore any wet stain, whether it comes from inside or outside is, in most cases, an active leak. For example, in the below photo, the plaster wall is visibly water-damaged. 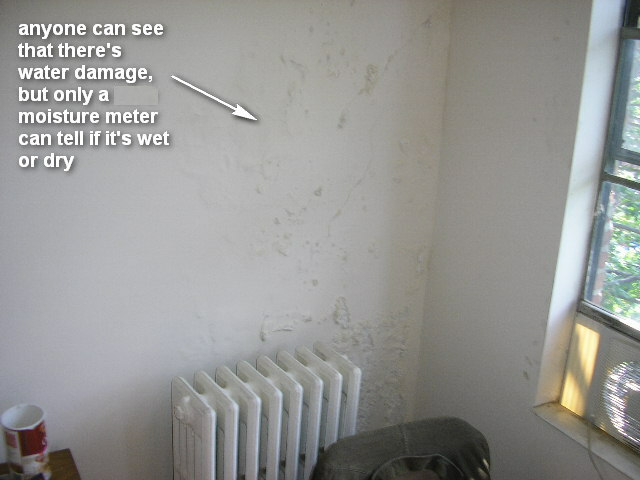 Most people would really want to know if the above wall damage is wet or dry. 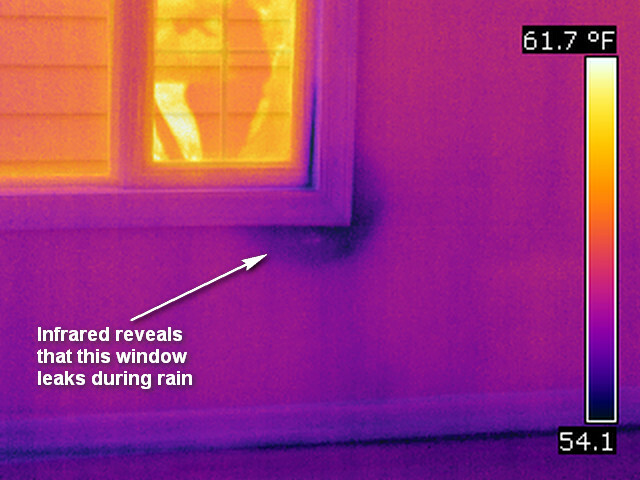 A few inspectors (including us) use infrared (IR) cameras during inspections. While these devices are useful in identifying missing insulation and electrical overheating, they are also really great at locating areas where leakage occurs, but where no visible staining is present. The window, and a few others like it in this house, showed similar signs of leakage. The installer clearly had no understanding of proper window installation, and therefore all of the windows he installed are suspect, whether they show signs of leakage or not. This cannot be fixed with caulking. The windows would need to be removed and correctly reinstalled or else they will always leak. The repair would involve removal, reflashing, and reinstallation of windows and could run upwards of $1000 per window. Of course any inspector needs to be trained in using the IR camera, which does not see moisture, only temperature differences on surfaces, therefore the "stain" in the above photo would need to be tested with a moisture meter to determine if it is wet. To be fair, moisture meters and IR cameras can only be effective in identifying conditions when they exist. For example, many roof leaks do not leak every time it rains, perhaps only during a really heavy rainstorm that only occurs every few months. Therefore, water stains can dry over time and the moisture would not then show up under IR. So while we can't expect usage of a moisture meter and IR to locate every possible and potential water leak, a good inspector will be able to learn a lot more using these tools, than someone who only does a visual inspection. This is a worthwhile conversation to have when looking to hire an inspector, because as we've learned through years of using an IR camera, houses and buildings leak more than you might think. Do you do combustion safety testing on heating equipment? Practically every building has gas- or oil-fired heating equipment (except for buildings heated with heat pumps, which have their own set of problems). Combustion safety testing determines whether the fuel is burning efficiently and fully escaping through the chimney. Poor combustion is potentially deadly. Every so often we have cleared everyone out of a house and opened all the windows because of high carbon monoxide levels. Do you enter accessible attics and crawl spaces? Attics and crawl spaces can provide critical details about a building. Entering these spaces often requires an inspector to be in good physical shape and small access openings may prevent access by (to be as polite as possible) portly inspectors. Therefore, an attic or crawl space may be disqualified as "inaccessible" simply because of the physical characteristics of the inspector. Environmental (asbestos, lead, etc.) testing -- what to look out for! Many inspectors will have add-on services -- whether included in a comprehensive inspection fee or at an extra charge -- that may or may not be useful and it is helpful to understand the context and scope of these services so that you can decide if they offer any real value to the inspection service. Performing a radon test in a building you don't own can be challenging, as the test must be left undisturbed in a sealed basement. When you don't have control over that environment, tampering could occur, unbeknownst to you. The 48-hour test is a snapshot that may not provide the full picture, as radon levels can fluctuate over the course of the year. These two conditions could cause the 48-hour test to result in a false negative. The good news is that even if radon levels are elevated in your building, mitigation systems are not very expensive. Lead paint was widely used in buildings in this area prior to 1978 and cannot be identified visually. Therefore, any building older than that has a good possibility of the presence of lead paint. Lead poisoning mainly occurs by eating it and is mainly a concern for children under age 7, as they touch everything and put their hands in their mouths. We do not offer this testing, but if lead paint is a concern, we suggest an X-ray fluoroscope lead survey, which can be done for usually a few hundred dollars. This is a superior testing system and a report can be generated easily and non-destructively describing the lead content of every surface in the building, even if the lead is beneath several coats of paint. There are many inexpensive tests, which involve some type of magic marker, that are unreliable. Since these magic marker test kits are readily available in any hardware store, so should you decide to go this route, it is better to do the test yourself rather than pay multiples of that cost to an inspector to do the same test. If you're interested, we can offer a referral for X-ray fluoroscope lead paint testing. This can be useful, especially if you're buying a house that is served by well water (East end of Long Island). It is law (although not often enforced) that during a sale, Suffolk County homes served by well water must have a county-approved full screen performed, which tests for the presence of over 60 analytes, including pH, coliform bacteria, lead, other metals, organic and non-organic compounds. Since samples need to be at a lab within 24 hours of collection, sampling is usually not done on Saturdays. If you will b e contracting for water testing, the inspector should provide a list of analytes that will be tested. Mold testing is a procedure that is misunderstood at best and sold unnecessarily by unscrupulous or improperly trained consultants at worst. First, when visible mold is present, culture testing (determining species) is unnecessary unless you need to determine the mold species for legal or medical reasons. Any visible mold should be remediated regardless of species and whether it is wet or dry. And it if is wet, the source of moisture needs to be corrected prior to replacement of damaged materials. Air testing for mold should only be performed in a house or building you own because elevated levels of mold could be present in an old couch or carpet that will be removed prior to your occupancy, and therefore testing will not reflect conditions that would be present after the seller vacates. Some inspectors like to offer air sampling for mold. This type of testing should really be part of a comprehensive Indoor Air Quality investigation during which information is being gathered based upon complaints or concerns about a building. Or it should be done as part of a remediation protocol involving baseline sampling and clearance verification. Testing should only be done after a comprehensive walkthrough inspection and any "mold inspector" should be able to provide a report on potential causes of moisture/leakage and how to correct it. Very often, indoor air quality issues can be resolved without the extra expense of mold testing. When utilizing air sampling, a number of samples needs to be taken in order for there to be some level of statistical confidence. Simply taking 1 or 2 random samples without trying to prove or disprove a formulated hypothesis would have limited or no usefulness. There are NO established safety levels of mold and any testing should be part of a well-developed regimen. Mold and its effect on people is as of yet only barely understood even by top mycogists and industrial hygenists. Anyone who claims to be throwing this type of sampling into a typical house inspection is using it as a sales gimmick and the results, no matter what they are, will not likely be meaningful. Some claim that by flushing dye or tablets, septic failures will show up in the yard. This test is only (and not always) useful on a property with a septic tank and leaching field as opposed to a cesspool. A proper leaching field requires a large area of property, so this type of waste management system is not generally found in the New York metro area, as properties tend to be small. The dye test is useless on a cesspool and anyone who suggests otherwise should be regarded with suspicion. If your property does have a leaching field, there needs to be a comprehensive evaluation done by a professional septic company, not just dye tablets. A cesspool or septic system can best be evaluated by a camera at the end of a plumbing snake called, crypticlly enough, a snake camera. This is best done by a cesspool/septic service company becuase they have lots of experience in these areas and can provide a very detailed report on the conditions of these systems as well as accurate pricing for any needed repairs. Some inspectors offer these as part of their service. While these warranties make for a nice selling point, they typically feature per-occurance fees, deductibles and restrictions/limitations. If these warranties sound attractive to you, be sure to read the terms of the agreement first, as they may not be as worthwhile as they appear. Something else to keep in mind: Beware of home inspection companies that offer "free" add-on items, such as home warranties, books & videos, or gift cards, as part of the inspection fee. These items are rarely worth the money you would spend if you bought them yourself and are typically marketing gimmicks rather than real value additions. Companies that offer marketing gimmicks often do so because the service you're actually hiring them to perform is somehow lacking. Be assured that anyone who's been in this business a long time does not have to rely on gimmick marketing. Marketing gimmicks are commonly offered by inspectors that are new to the business and try anything they can to lure in unsuspecting clients. Keep in mind what you really need: If you're spending several hundred thousand dollars or more on a house, you need a consultant who brings experience and substance to the table -- not a Home Depot gift card. In New York State, home inspections may only legally be performed by a licensed architect, a licensed engineer, or a licensed home inspector. By definition, one does not necessarily provide better service than another, no matter what you may have been told. Home inspection is a very unique discipline and the prospective inspector should have proper training and experience specifically in house and building inspections, regardless of which license they carry. So, therefore, it is important to ask the other questions on this page to get a better idea of whom you're hiring. No licensing of any kind is required for commercial buildings, which includes residential buldings housing more than four families. After licensing for home inspectors was made law in NYS, inspector schools sprung up and tripled the amount of home inspectors across the state by providing a course specifically tailored to meet home inspector licensing requirements, which right now are not very stringent. As a result, there are now far more "weekend warriors" out there than full-time, competent, experienced inspectors. As with any type of school, there is rudimentary training, but graduates are by no means qualified to go out and start giving you advice on the biggest purchase you probably will ever make. Inspectors can and must take training before entering the field, but all the training in the world is no substitute for experience. (Hint: Those who advertise their training may not have the experience you should be looking for.) The bottom line is...you want to make sure you get an inspector who has the experience to provide you the information you need. Fully certified membership in a home inspection trade association is a good indication that a prospective inspector is serious about their work. Membership is not cheap and requires annual continuing education that is currently more stringent than New York State licensing requirements. The oldest, most well-respected association is the American Society of Home Inspectors (ASHI). It is a non-profit association dedicated to educating its members and promoting quality service to the public. The local chapter holds regular monthly meetings to share experiences and provide ongoing education. To become fully certified in ASHI, one must pass a difficult exam and prove that they have completed a considerable number of fee-paid inspections, which are then verified to be in compliance with the standards that the association has set forth. They must also adhere to a strict Code of Ethics. The majority of home inspections is performed by licensed home inspectors, not engineers. Most engineers that do this work perform home inspections, not "engineering reports". A licensed engineer is not automatically qualified to do house and building inspections. Engineering is a wide field of study. There are environmental engineers, chemical engineers, civil engineers, mechanical engineers, electrical engineers, to name a few. 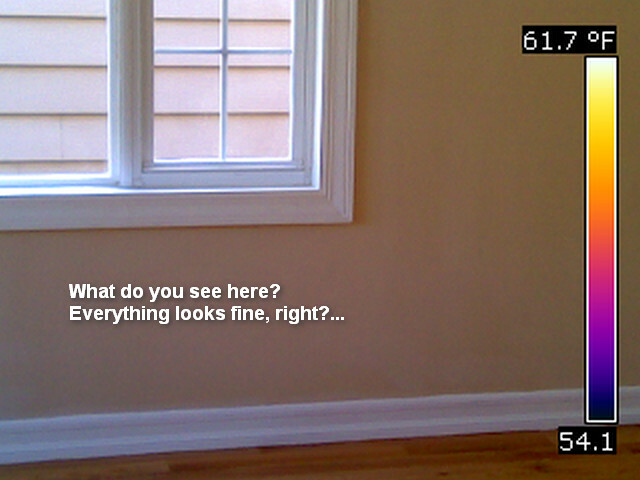 The art (yes, it could be argued that this is an art) of home inspection is not taught at any engineering school. Also, all engineers are not licensed engineeers. One must complete schooling, years of experience, and a challenging exam to be a licensed, or Professional Engineer. Engineers generally have a very high mechanical aptitude, and so are they very good candidates for this field. But just like anyone else, they must be trained in the specific process of house and building inspection and they must also have an ability to effectively communicate information to lay people, both verbally and in writing, a skill which many engineers (and home inspectors, for that matter) lack. What is an "engineering report"? There is no widely accepted definition for residential buildings. If we examine the standard set forth by the National Academy of Building Inspection Engineers, the premier trade association for engineers who do home inspections, we see that it is 4 pages long and offers a short, vague description of what would constitute a home inspection. This basically leaves it up to the engineer as to what will be covered in the inspection. Compare and contrast with the standard from the American Society of Home Inspectors, the premier trade association for home inspectors (which, by the way, counts many engineers as members). We see that it is twice as long and describes the inspection process in much greater detail. Therefore, if you absolutely will not be satisfied unless a person with an engineering license does your home inspection, it is very important to have them provide you a detailed written explanation of their methodology. (Note that by this company's standards, even the ASHI standard of practice is quite limited, and it's a good idea to ask for a written detailed methodology from anyone you hire). When the term "engineering" is used in various engineering texts, the implication is that hard calculations will be involved. To read the language that one might find on websites of licensed engineers who offer home inspections, one might conclude that the level of detail included in their inspection will be much higher than that of a licensed home inspector and that hard calculations will be involved. But given all of the engineer reports we have read, that is simply not the case. No hard math is used. You can't tell the difference. For example, engineers have argued that they are more qualified to do evaluations of design far exceeding the qualifications of a home inspector. That may be true, but the reporting doesn't demonstrate it. Here are two examples: structure and heating equipment. Structure. We have read on some engineer websites that they will evaluate whether a building is or is not structurally sound. But this can't be done unless all structural components are visible. In most cases, we can only see parts of the roof structure if that space is accessible and the basement, unless it is finished off. Most of the structural components of the building are concealed (and all engineers / inspectors disclaim concealed items). Therefore, the "evaluation" can only be done by inference -- are the walls plumb? Do the floors look (reasonably) level? Do they bounce when you walk on them? Any suspicious cracks? Anyone who is well-trained and experienced in this work, engineer or not, will be able to identify potential structural issues. We have never seen within any "engineering" reports any detailed calculations that are actually used to verify that the structure is indeed sound or not. If building plans are available, they can be reviewed if (and that's a BIG if) the engineer is actually qualified to do it, but such design review would certainly not be included in the scope and fee of a typical home inspection. (Also, building plans do not necessarily reflect what was actually constructed.) The good news is that New York State and NYC have some of the highest construction standards in the world and serious structural issues in residential buildings are not so common. Heating. We have read on some engineer websites that they are uniquely qualified to evaluate whether a heating system is sized properly for the building. If this is done by examining the output capacity BTUs on the data plate and eyeballing square footage, then that's a rule-of-thumb estimate, which is not engineering (and is highly inaccurate, by the way). The actual determination of a building's heating load and proper sizing of heating equipment is a complex calculation known as an ACCA Manual J (which also calculates the cooling load for air conditioning sizing). This calculation involves detailed inputs including not only heating equipment characteristics, but also conditioned floor area, volume of conditioned space, exposed wall/ceiling/floor surface areas, insulation levels, quality/orientation of windows/doors, building shell and air duct leakage, etc. It is usually done with specialized equipment and a software program and the process takes several hours. You can have the greatest heating system made, but if the windows are lousy and the building leaks air like crazy, then you might have compfort issues. This type of calculation is far outside the scope of any typical home inspection. Most engineers (as is true for most home inspectors) do not use ladders to access roofs and do not use cutting edge tools, such as infrared cameras, gas detectors, and moisture meters, in the typical course of their daily work. You must specifically ask about what tools will be used, as they are incredibly useful (see below) in uncovering information that cannot be determined through visual inspection only. That being said, there are very talented engineers that work in this field and give great service. There are also not-so-talented engineers that give not-so-great service. The same can be said about licensed home inspectors. So the point here is not to dissuade you from hiring an engineer over a home inspector. The point is that you must carefully interview whomever you hire to make sure they will be able to provide the service you need. This is actually a good question to ask. There are two types of insurance that home and building inspectors might carry: General Liability (GL), which insures against damages to the property caused by the inspector, and Errors and Omissions (E&O), which insures against major mistakes or negligently omitted items in the report. State law requires home inspectors to carry GL as a license requirement. E&O is optional and only about half of the inspectors carry it. E&O insurance is expensive and the fly-by-night or part-time inspectors generally won't carry it, so you could use this question to help determine how serious of an inspector you are dealing with. Can I speak to the inspector prior to making an appointment? You should be able to make your specific concerns known ahead of time. This not only allows you to establish a comfort level with your inspector, but will help you determine if the inspection service will meet your needs. How much notice do you need to make an appointment? In this business, the seller usually wants things done as quickly as possible and inspection companies have adapted to this need. Most companies can provide an appointment to your convenience if you provide 2 to 3 days lead time. In many cases, you can get an appointment with less notice, albeit with less likelihood. What preparations should be done for the inspection? Be sure that whoever is providing access to the building understands that all areas of the building should be made accessible (which can be somewhat challenging if there are tenants involved) and make sure they understand that we will need the building for a few hours. If the building is vacant, try to arrange to have all of the utilities (water, gas, electricity) turned on, as you get the most out of the service that way. Try to avoid bringing small children if possible as they can be a distraction. Be sure that all areas are accessible. This means that keys should be available for garages and other locked areas. Heavy storage should be moved away where they block access to utilities and crawl spaces/attics. If tenants are involved, they may need to be present for the inspection. Because tenants have no vested interest in the sale, they can be sometimes difficult to deal with. Multiple tenants can complicate access even further, as you might imagine. For apartment buildings, make sure that access will be provided for the roof and basement areas. A smaller house such as a 3-bedroom ranch or cape, typically takes about 1 1/2 - 2 hours. A larger house, such as a brownstone or a 5-bedroom colonial with central air, a pool, and a second kitchen will take 2- 3 hours or more. Multi-family or multi-floor buildings similarly take longer. We confer with clients afterward for a verbal discussion of everything observed. The verbal reports we offer after the inspection can last anywhere from 20 - 30 minutes up to an hour or even longer, depending upon how much information needs to be presented. The inspection can go quicker if conditions are obvious, and slower if conditions are more complicated. Buildings and houses with more equipment take longer. After the inspection, the report is delivered within one business day by email and the hard copy arrives shortly after that. We feel that you get the most out of the service by attending. Not only will you have the opportunity to see how a house/building inspection is performed, but also we give an extensive verbal report at the end of the inspection that will help reinforce the information appearing in the written report. When is the right time in the purchase process to do an inspection? Customarily, the inspection happens between the time when your offer is accepted and when the sales contract is signed. It is important to have a property inspected prior to signing a contract, as information could be revealed causing you to require further negotiation or possibly affecting your decision to buy the house altogether. Once you sign a contract, your ability to negotiate is greatly reduced or eliminated. You could have an inspection contingency written into the sales contract to address this concern, but that is a conversation to be had with your attorney. What else should be done to prepare for the inspection? At the inspection site, it is recommended to limit the amount of family members present, as home owners may already be stressed out and they may not wish to have several strangers walking all over their house. It is also recommended to avoid bringing small children as they may cause distractions. And if the building is vacant, try to ensure all utilities (electricity, gas, heat) are turned on for the inspection. Be sure that all areas are accessible. This means that keys should be available for garages and other locked areas. Heavy storage should be moved away where they block access to utilities and crawl spaces/attics. If tenants are involved, they may need to be present for the inspection. Because tenants have no vested interest in the sale, they can be sometimes difficult to deal with. Buildings with multiple tenants can complicate access even further, as you might imagine. For apartment inspections, make sure that access will be provided for the roof and basement areas. Does this building/addition/modification meet code? That is usually impossible to answer from a typical inspection, and can only be proven by documentation on file with the building department. For any building department to certify a structure as code-compliant, various municipal building inspectors (for plumbing, electrical, HVAC, etc.) visit the property during different phases of construction to verify that components, which will eventually be concealed by finished walls, have been installed properly. Once walls are finished, this verification is impossible. In fact, for a building department to certify construction that was done without permission, very often they will require removal of walls to see the concealed wiring, plumbing, etc. Generally, if work was done to code at the time it was built, it is grandfathered. However it is typically quite difficult to know precisely when construction was done and what prevailing codes were at that time. So the best way to verify that a given building is code-compliant is to get the Certificate of Occupancy from the local building department. A Certificate of Occupancy states that a building or modification was approved by the prevailing authority and in the case of living space is legally habitable.